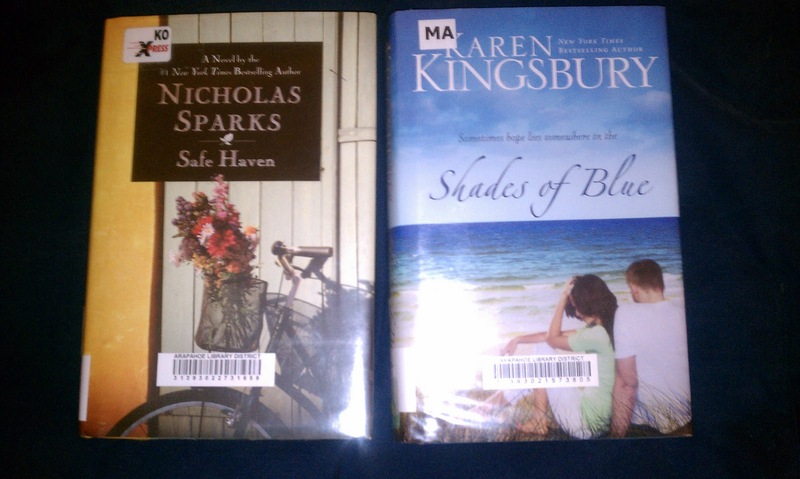 In the past week, I read both of these books. I found them browsing at the library. Now, I've read a few Nicholas Sparks books before. They are always good reads, but sometimes you can predict what might happen. If you haven't read any of his books, you've probably seen at least one movie: Nights in Rodanthe, Message in a Bottle, Dear John, The Last Song. Some might say there is even a "formula" (click here for a fun visual from cracked.com). Safe Haven was a great read and even had a happy ending. I had never read a book by Karen Kingsbury before. Surprisingly, I made it through Safe Haven without crying (hard to believe for a N.S. book), but not Shades of Blue. The book was about (in brief) two main characters who had grown up together and been in love up through high school. Fast forward 10 years and they are both in a different place in life and trying to reconcile with their collective past. It is a 'love story' but not in the traditional sense. K.K. is a Christian fiction author, and now having read one of her books, I will certainly read another. Something I really enjoyed was that she runs/participates in a program called "Forever in Fiction" where people can bid, with the money going to charity, to have a friend/family member put in one of her books. In Shades of Blue there were three characters that were based on real girls who had died young. You can read about them at the beginning of the book. I think it is a wonderful and faithful tribute and something unique.